I STOOD at the summit of Beinn Bhuidhe yesterday, another Munro completion realised. Note the spelling. Completion rather than the archaic ‘compleation’, which is historically used to denote a full round of Scotland’s highest peaks. This lone mountain which stretches away from the head of Loch Fyne was not the scene of another finish. It was only No.178 on my fourth round, the one I have sworn will be my last. But it was the last remaining Munro to grant me a full view from the top. 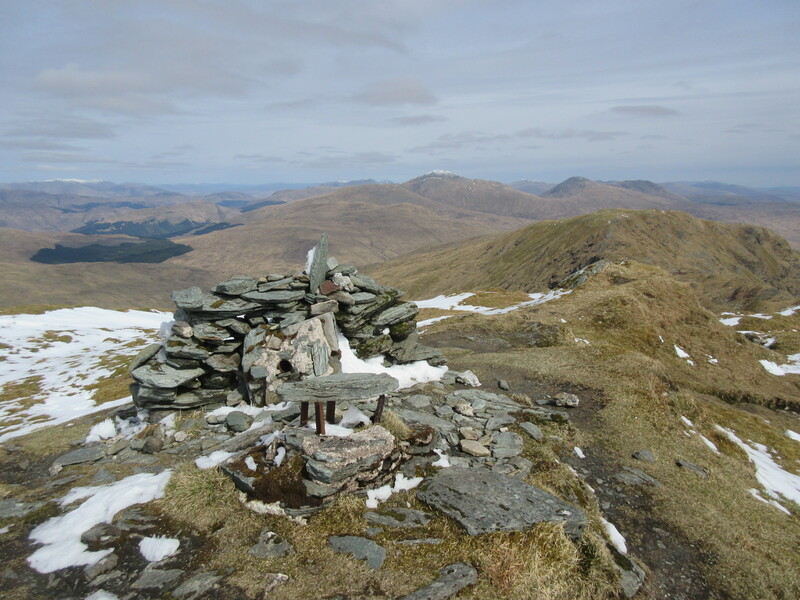 I have managed to get a perfect view at least once from every other Munro over the course of three previous rounds, but never Beinn Bhuidhe. For a few years now, I have been waiting for the ideal moment, the perfect time to strike. But the longer one waits for something, the more the chance that paranoia creeps in. There were plenty of promising weather days, but I was looking for a guarantee, a rarity in the Scottish climate. Even a 90 per cent chance of clear conditions would cast doubt in my mind: What if my particular hill fell into that other ten per cent? I didn’t want to head out there just to be thwarted again. It’s easier to choose another peak in another part of the country and keep my nemesis for another day, one that would come with a guarantee. My first ascent of Beinn Bhuidhe was in the middle of the night back in 1996, a climb which started in darkness then progressed into a day of thick mist rather than hoped-for sunshine. I always reckon I did pretty well in that first round, but there were still around a third of the Munros which failed to yield views, and this was one of them. In the end, I reached the summit and then moved on to the next target. Eight years later, and I was back, two of us heading up with hope on a benign March day. After reaching the flattening at the top of the gully above the old house at Inverchorachan, we entered the cloud and the higher we got the more the wind bared its teeth. It was not so benign on the ridge. Old snow made progress difficult and our faces were being stung by wind-driven ice particles. If there was any view (there wasn’t) we were unable to stand up and see it. By the time I made my third attempt in 2008, every other so-far invisible Munro summit had fallen. 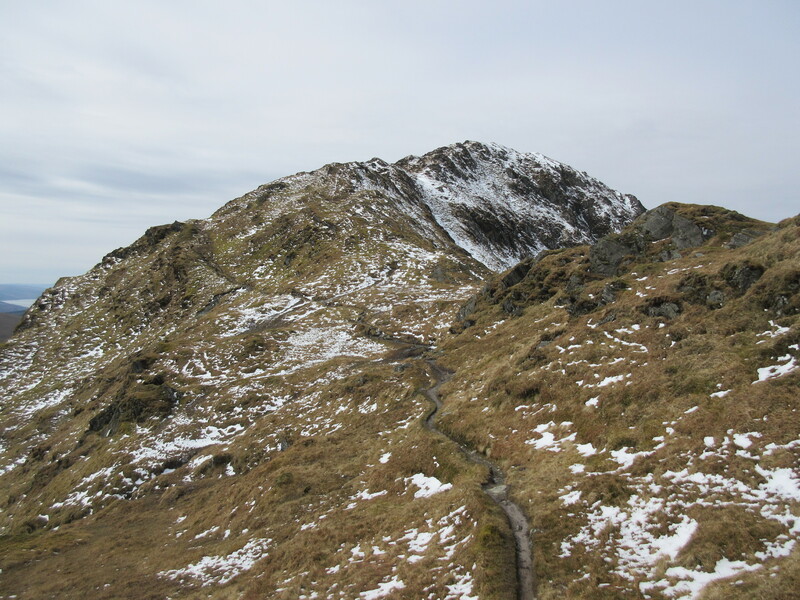 Beinn Bhuidhe was the lone stand-out. We set off with a promising November forecast - 70 per cent cloud-free! - every mountain passed on the way up standing clear, this had to be the day. But again the area at the top of the gully proved to be a cloud magnet and the peak remained elusive. As if to underscore the point that weather forecasts often border on fantasy, the rain came on and we spent the next five hours taking on more and more water. I felt this mountain was having a real laugh at my expense. Time rolled on with neither the forecast or the opportunity seeming just right. But yesterday, some eight and a half years after that last attempt, I decided to give it another go. 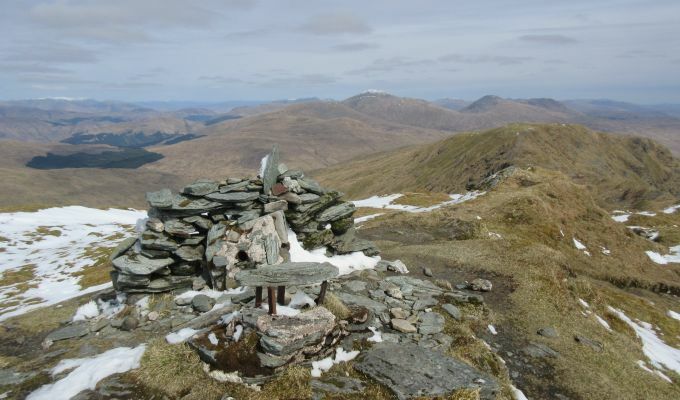 Cloud-free Munros? Almost certain. Even then, the long drive over wasn’t entirely convincing. Early mists played around the high slopes, summits either sitting under cloud or fading into bland skies. I was beginning to fear another wasted journey. We made the long walk-in without a hint of sun but as we rose blue skies appeared and then I caught my first ever sight of the full ridge ahead on the horizon. We passed icicles and tramped over patches of soft ice and more solid snow and then reached the cairn fashioned out of a long-collapsed trig point to a 360 degree unblemished view. It felt every bit as fine as a real ‘compleation’.